This is a quick tutorial with photos to help you change the oil on a 2014 Subaru Forester XT. This tutorial should apply to any subaru using the 2L direct injection engine (FA20F engine). In reality all of Subaru’s new engines are very similar so I expect everything will be the same. I’ll try to include any changes between new subarus, but try to verify torque specs and what not for your specific model. Don’t like to Read? See supplemental video at the bottom of this post. Synthetic Motor Oil (Synthetic is required in the direct injected turbo engine) I do not believe the normally aspirated engines require synthetic motor oil, but be sure to check the manual. Socket or wrench 14mm (Drain Plug). Warm up your car to normal operating temperature. You do not change the oil on a car when it is cold. Drive your car up on ramps and place your oil drip pan under the car. With the forester you will probably have enough room to work under the car without driving it up on ramp or jacking it up. (I’m nearly 250 and I can get under it.) For the WRX you will need to jack it up or use ramps…. or use a curb…. Note: If you drove your forester up on ramps the oil has a long way to fall and may splash out of the pan if it is shallow. If I’m not in a hurry I usually let it drain for 20 minutes or more. Clean dirt and dust out of the oil catch cup around the filter. A damp cloth works well. Be careful the edge of the cup is very sharp. Remove the oil filter. The filter uses a Size “B” Cup. As with any car make sure the rubber gasket stays with the filter. If you ever stack two rubber gaskets you will have a mess to deal with. Rub oil around the rubber gasket on the new oil filter. Install the new filter. You will snug it up just past hand tight if you have the “B” Socket Cup. Hand tight is probably OK if you don’t have it, but good luck getting it off. The cups are about $5 at your local auto parts store. If you don’t have a torque wrench… You tighten it up until its tight. You will feel the crush ring collapse a little and then just go a slight bit past that point. Worst thing to do is over tighten it and start stripping out the threads in the oil pan. If you see that it is leaking after you do the job it is a quick deal to slide back under the car and give it a tap to tighten it up. Pour in the synthetic oil of your choice. I usually run Pennzoil Ultra Euro L | Pennzoil Ultra |or Pennzoil premium. <–Links are provided to the best priced stuff I could find. I have been running the Euro L lately. Look over your work and pull the oil pan out from under the car if you have not already done so. Start the car with the hood open and make sure every thing is as it should be. Most of our cars came with a black Roki Japanese filter 15208AA160 which has been proven to be superior to the blue Honeywell made 15208AA15A (feel free to look around your forum of choice lots of guys have cut them up). As long as you car is under warranty you will want to exclusively run 15208AA15A. Once you warranty runs out or you are willing to battle a little bit on warranty work you can switch to the filter of your choice (Technically they should have to prove that the oil filter caused a failure in order not to do warranty work on your car, but some dealers are shady). In general, WIX oil filters are considered the best among Subaru enthusiasts. The reason for the battle is that Subarus run a relatively high bypass valve setting. Most off the shelf filters will fit just like the original filter, but will likely have bypass valve settings between 5-15PSI. 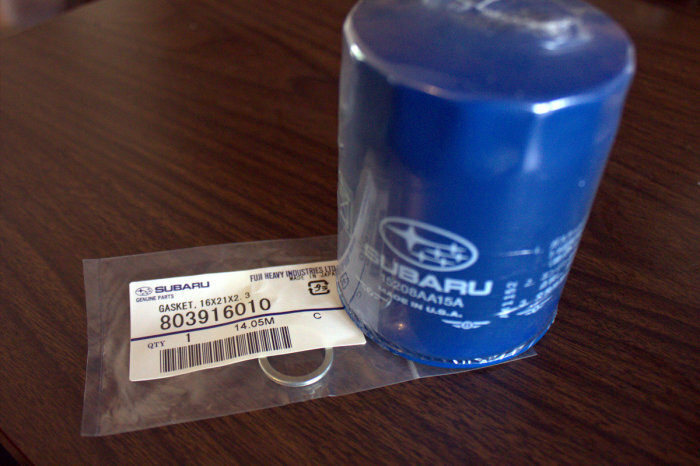 Most subaru engines require filters that have bypass valves that are rated a little over 20 PSI (All turbo Models). The original 15208AA160 filter had a bypass setting of ~23PSI. The WIX 57055 has a bypass setting 27 PSI and an anti drain back valve to keep oil in the filter rather than letting it all drain back into the engine. 15208AA15A The equivalent WIX part naumber is wix 57055. I have not noticed any significant consumption and from what I can see my engine is staying clean as advertised. I avoid Mobile 1 products for Subarus, as my WRX thought it tasted like candy. Other oils like Rotella T6 survived much better. If you feel like getting into the madness just go on some of the subaru web forums. Updated a little info and added some links to the products based on part number. Took some supplemental video while doing my oil change today. I will be posting links or incorporating those into this post sometime soon. I installed the Fumoto valve. I will eventually do a bit of a review on that. I think I probably drive gravel more than most people so it will be interesting to see how it holds up. Edit 2: 8/20/2016 Fixed some product links. Fumoto Valve is still in good shape 30K miles +. No problems there. I will pull it on the next oil change to make sure to clean out the oil pan. How is the fumoto value holding up? and did you use a crush ring when installing it? Thanks! I used the gasket that came with the Fumoto. It is holding up well from I can tell, but it has been awhile since I have been under the car. You do not want to use a standard crush ring with the fumoto valve as I believe the metal that is used to make the crush ring may actually be harder than the metal used to manufacture the fumoto valve. 1) Have you had trouble finding the original Black Roki 15208AA160? Is that why you are advising the blue 15208AA15A? 2) The Pennzoil you are recommending is 6 qt but Subaru Forester calls for 5.4 qt. Do you do any measurement to cut down the usage amount or just using estimation? Do you think it is it OK to use a 5 qt bottle? 1. The car is still under warranty. Subaru uses the blue ones so I use the blue ones. Yes the black ones are much harder to find. I know there are some Mazda filters that are suppose to be identical, but it just isn’t worth switching to something else before the car is out of warranty. My FXT us currently back in the shop again because it was leaking oil out of the camshaft position sensor for the second time in a year. 2. Use 5.4. Use what is left to top off when needed or on your next oil change and save a quart. Eventually you’ll have enough for another full oil change. Or… buy a case + 5 quart bottle and use it for two changes. I tend to run my cars near the full mark. If you did a poor job draining the car 5 qts might be enough, but I probably wouldn’t bank on it. Thanks for the blog and the video. So nice to have the filter on top. I am looking at getting a 2014/2015 Forester or Outback and just doing some research. I am surprised to hear you have oil leak on the 2014 Forester? How many miles you have on it? Was it fixed under warranty? I’d be upset if a 2014 leaks oil. I’ve had the same oil leak twice. Both times it was fixed under warranty. The first time it happened I had less than 1000 miles on the clock. The second time it happened I think I had around 20k. I’m currently up to 28 or so. I kind of wonder if a cam shaft position sensor hole was machined correctly. It always seems to happen when it is really cold outside. I also just noticed 5 or 6 noticeable dents on the passenger side pillar just under the rack near the back of the car. I really don’t think that part of the car could have made contact with anything so I wonder if the the panel ripped for some reason. I’ll probably have the dealer look at it but I’m not going to hold my breath on that one. Over all I’m not super happy with this car. It’s had quite a few problems for how new it is. Thanks for the video. I have a 2015 Forester. Apologies for a dumb question. I will be glad if you could post a picture of the place where you put oil in (where your camera died). I have never done this so getting everything known before I do anything dumb. Looks relatively easy job. It is the one closest to the filter. Visible in the photo on “Step 3” It will say engine oil on the cap and have the correct weight motor oil listed. This car is very easy to change the oil on, but if you have never changed the oil on anything before you might want to have someone walk you through it. I don’t think the video skipped any steps, but I didn’t really intend for it to be used as a first time oil change video either. 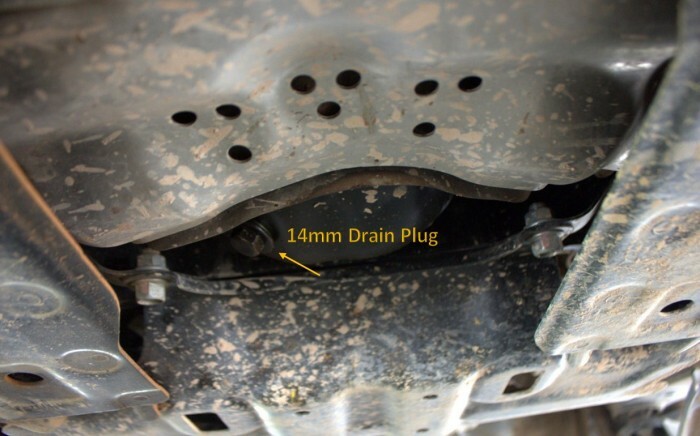 You will need to be careful putting the drain plug in the car (make sure to read step 5 above). That… and putting in the incorrect amount of oil are probably the biggest things you could do wrong. If you do not have the xt the amount of oil you put in the car will be different from what I listed. I am confused about the size of the drain plug. Fumoto F-108/F-108N drain valve is 16 millimeters. In this article, you showed us 14 mm both in the text and picture. The drain plug takes a 14mm wrench to get the plug out. I’m just talking about the head size on the original plug. The F-108 is the correct Fumoto valve for the Forester XT. https://www.subaruforester.org/vbulletin/f207/oil-drain-plug-size-2-0-dit-130217/ Discussion when the car first came out here. We have a 2014 Forester, and have been serviced only by the local Subaru dealer, including oil changes. I recently was under the hood (had to unhook the battery because the rear gate stopped working) and noticed that there is some oil in the cup around the base of the blue filter. Is this normal for a Forester? My wife said that every time we’ve had an oil change we find some drops on the garage floor under the front end of the car, and my wife is wondering the two things (the oil in the cup and the drops on the floor) are both normal? They guys at your dealer sound like they don’t take much pride in their work. No, there shouldn’t be oil in the cup. It means they aren’t wiping the excess oil out of the cup when they remove the old filter (just lazy). This will cause dust to build up in the cup and when they put the new filter in you risk having crap drop into your engine.